The Only Moon Phase That Can Produce A Solar Eclipse Is? Why Do USB Cables Feature Longer Outer Pins? Every month our Moon goes through a variety of phases from the full moon that poets, playwrights, and songwriters have written of so fondly over the years to the inky black new moon that hides its face from the world down below. While the new moon might not be much to look at during most months, if you look at the right time, you can see something spectacular that can only exist during a new moon: a solar eclipse. Unlike a lunar eclipse where a full moon passes into the shadow of the Earth, temporarily appearing to be darker and reddish colored, a solar eclipse only occurs when an actual new moon passes between the Earth and the Sun. Despite the belief that solar eclipses are more rare than lunar eclipses, it’s not true: somewhere on Earth approximately two of each are seen each year. One reason, however, that solar eclipses feel so rare is because they are visible from a much smaller part of the Earth than a lunar eclipse. Because of the geometry of the Moon’s inclined orbit (more than 5 degrees) compared to the Earth’s orbit around the Sun and the distance between us and the Moon during the course of its elliptical orbit, a solar eclipse is only visible to people on Earth in a band roughly 300 miles wide. Further, only a fraction of the people in that band will be able to see a total solar eclipse. So the next time you hear about a total solar eclipse in your area, get some proper eye protection and enjoy a rare astronomical show. 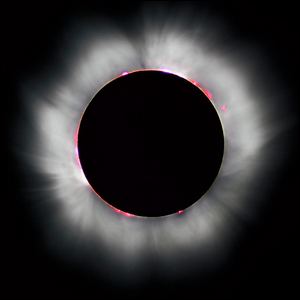 Bonus Trivia: If the Moon were in a perfectly circular orbit, a little closer to the Earth, and in the same orbital plane, total solar eclipses would occur every month. Image courtesy of Luc Viatour.